Action Packed 800 Calorie Fitness Workout in St. Austell! Get Fit & Look Great!! When you take the Fitness classes at Kernow Martial Arts, we'll whip you into great shape faster than you ever thought possible. In no time at all, you'll effortlessly lose your unwanted weight and you'll be sliding into your skinny jeans with room to spare! T'n'T Fitness is a 30 minute high intensity Cardio fitness workout for both men and women of all ages. T'n'T is a non-contact and completely safe workout that is completely safe and provides a fun, supercharged, calorie burning, muscle toning and stress killing workout. 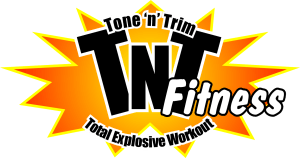 The T'n'T Fitness classes are taught in a very fun, high-energy atmosphere and are designed for participants to work at their own pace while increasing their cardiovascular fitness. We've gone out of our way to put together a Fitness program that's second-to-none. T'n'T Fitness makes maximum use of the newly fitted Functional Fitness room using a wide range of equipment from dumbbells to battle ropes and a variety of body weight exercises. GET MIND BLOWING FITNESS RESULTS AT KERNOW MARTIAL ARTS! Our Fitness classes will give you nothing you can't handle. They're intense, full of energy and a great way to improve your overall health! Find out more right now! Just fill in the request box on the side of this page and you'll receive all the information you need to get started in our incredible, fat-burning T'n'T Fitness classes today!